We are proud to announce a great opportunity for one vegan miam reader (EU Residents Only) to win an assortment of Violife products including a Violife t-shirt. Yay! Finally!!!! Violife is a Greek company that produce a wide range of vegan cheese alternatives – their coconut oil based cheese alternatives are all vegan, gluten-free, soya-free, palm oil-free and GMO-free! Violife blocks, slices and creamy spreads are available in over a dozen flavors and can be enjoyed cold or melted. 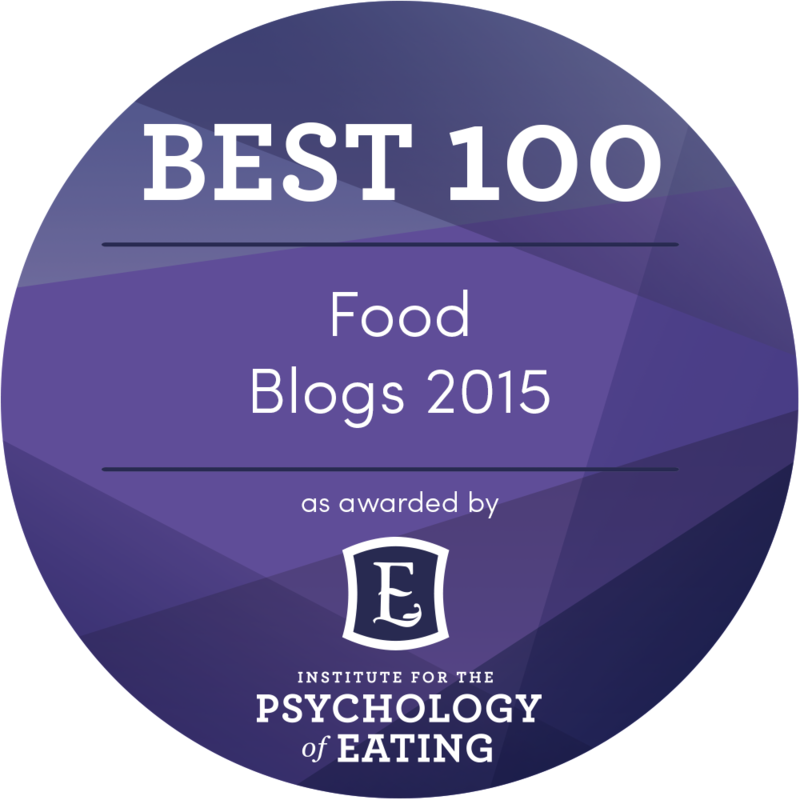 We love Violife by Viotros vegan cheese alternatives and now we get to share the love! Violife is owned by Viotros who also produces and packages processed cheeses and alternative dairy products that are based on vegetable fat. 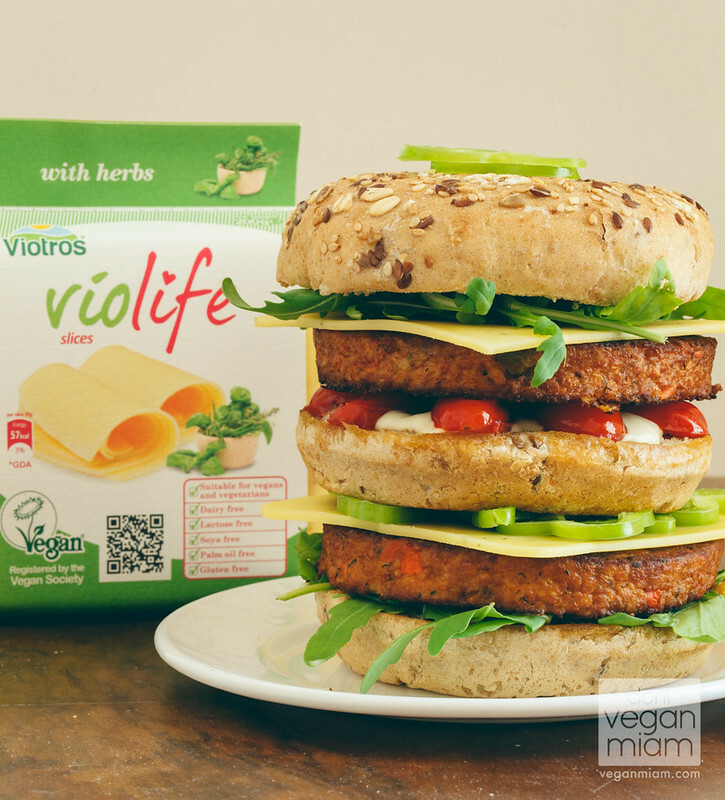 All of Violife products are vegan, gluten-free, soya-free, palm oil-free, and GMO-free. Read more about Violife here. 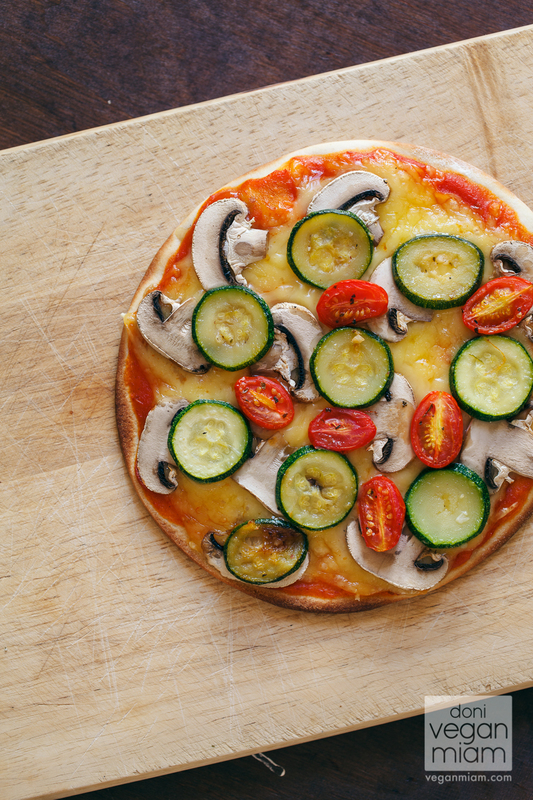 Violife Blocks & Slices are currently available in 12 flavors: Original, Tomato & Basil, Herbs, Peppers, Hot Peppers, Cheddar Flavour, Mushrooms, Olives, Olive Oil, Pizza Flavour, Mozzarella Flavour and Smoked Flavour. Violife Creamy is currently available in 5 flavors: Original, Tomato & Basil, Herbs, Cucumber & Dill and Hot Peppers. Their products are available in Czech Republic, France, Germany, Greece, Holland, Hungary, Poland, Slovakia, Slovenia, Sweden, Switzerland and UK (since March 2013). For an updated stockiest list, view here. 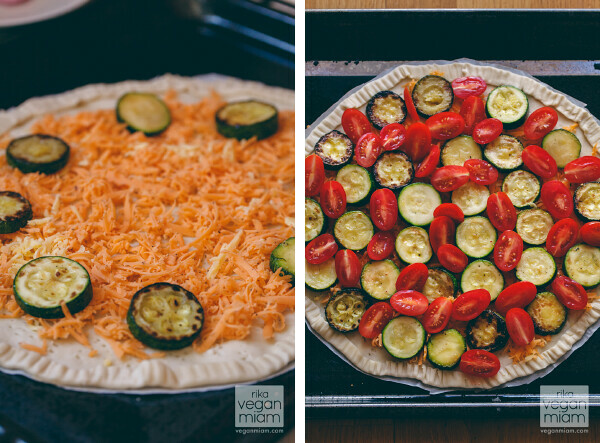 Last summer, we spent some time in Spain and tried Violife vegan cheese slices (Original, Tomato & Basil, Herbs, Hot Peppers, and Mushrooms) and one cheese block (200g) for Pizza. We also tried their creamy spreads (Original, Tomato & Basil, Herbs, Hot Pepper and Cucumber & Dill). We made all sorts of meals such as quesadillas, creamy pasta, sandwiches, pizzas, burgers, and used creamy spreads on toasts. View recipes + details for the following meals here. 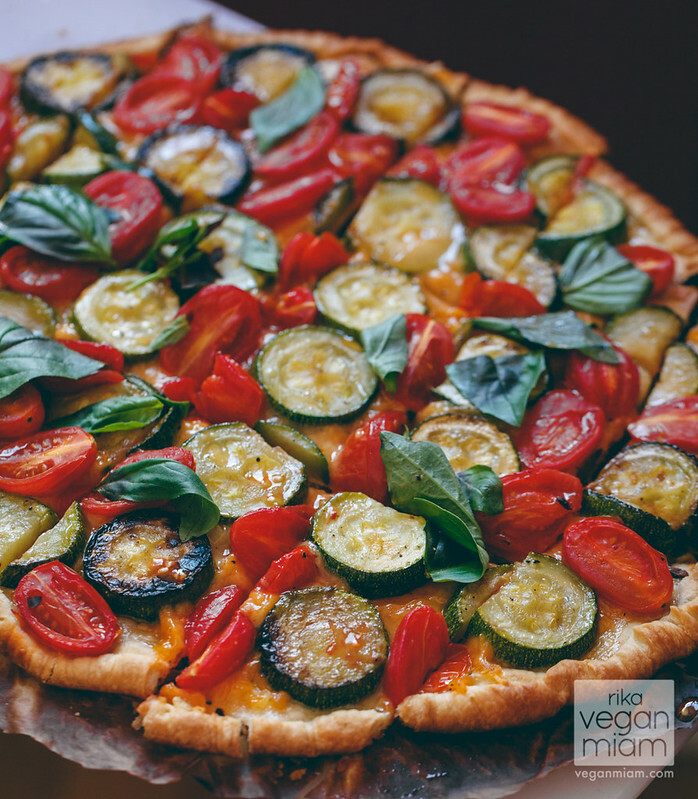 We made Pizza Vegana de Vegetales y Queso (Vegan Vegetable & Cheese Pizza) with Violife Pizza Cheese block (200 g). I shredded the whole package of the Pizza cheese block using a grater; they are available in bricks (2,5kg) and blocks (200g). The Pizza cheese melts really well as long as they are shredded, the color changed from light yellow to a medium yellow. After cooling down at room temperature for few hours, the cheese remains in its melted form. It is a good sign because some vegan cheese tend to form into different shapes. They are so good on pizzas, especially for fajita melts! 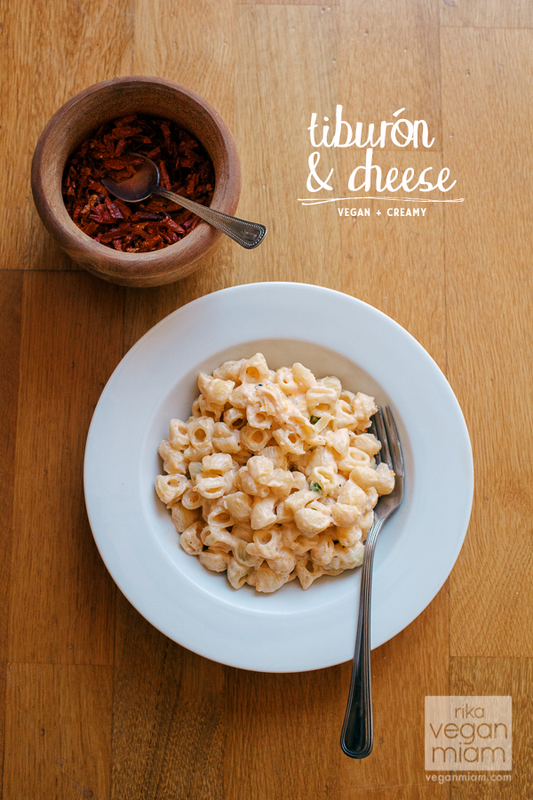 I used Violife Original Creamy Spread and Violife Tomato-Basil Cheese Slices for my Tiburón & Cheese dish. The Tomato-Basil cheese slices smell wonderful with basil, however once mixed and melted with other ingredients for the pasta dish, the flavor was very mild yet creamy! I shredded the whole package of the Violife Tomato-Basil cheese slices (press them together as a “block” and shred using a grater), they are also available in bricks (2,5kg) and blocks (200g), but I received the slices to sample. I prefer them shredded for melting, however as slices, they are great for sandwiches, burgers or on its own. I used Violife Cucumber & Dill creamy spread in my chickpea mash, but it’s optional. I love this creamy spread, it reminds me of tzatziki with the fresh dill and cucumbers. You can add fresh dill and a bit of vegan plain yogurt or mayo instead. I’m sharing one of our meals in Valencia, Spain: the Vegan Provençal Cheeseburger with Violife Tomato & Basil cheese slices, Provençal hamburger patty by a Spanish brand Natursoy, arugula, whole grain mustard, hummus, sautéed green bell peppers and onions, and of course, the salt & vinegar chips from the supermarket Carrefour in Spain. 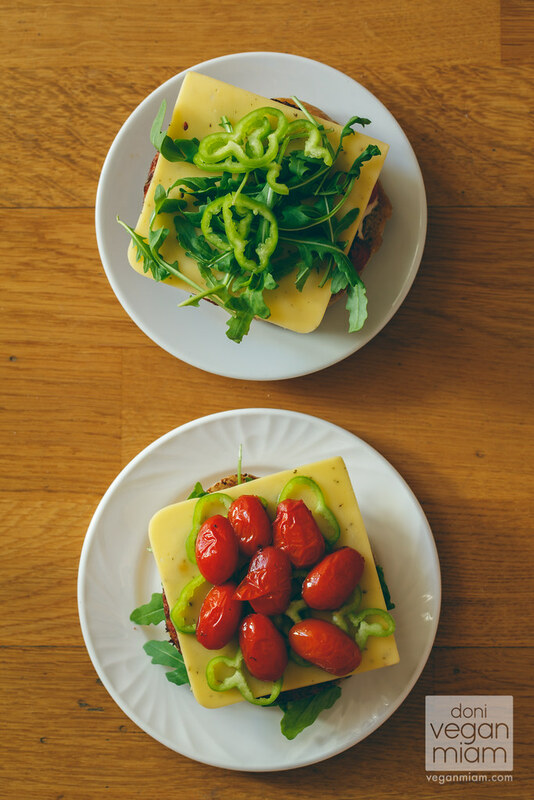 The Violife cheese slices are perfect for a burger or sandwich. You don’t need to broil or melt these cheese slices at all. 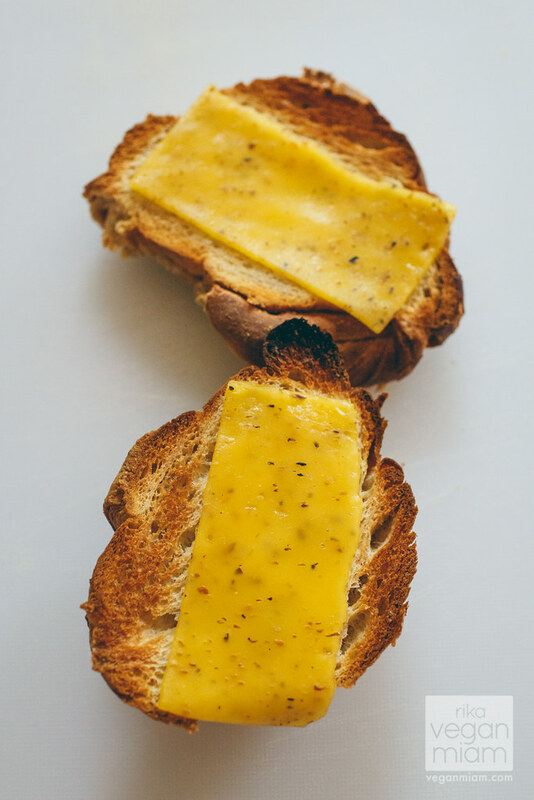 The texture is soft, the color is a beautiful “cheddar”, and it has a slightly sweet, but a robust, savory tomato flavor with a mild basil aftertaste. We shredded and melted the Violife Hot Pepper Cheese slices using a cheese grater. 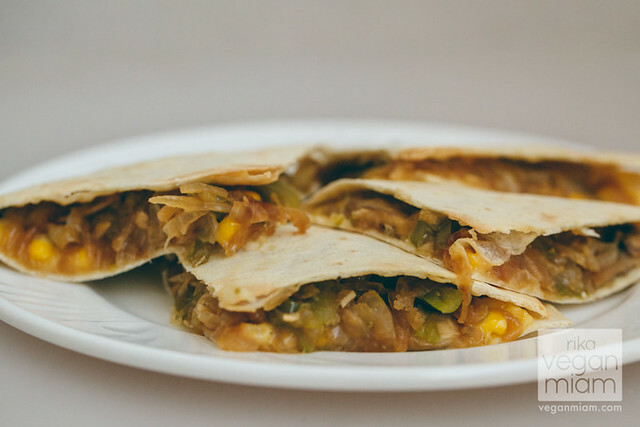 The melting shreds are perfect for fajitas, quesadillas, empanadas, calzones or burritos, or even on lasagna or cheesy pasta dishes. The Hot Peppers cheese reminds me of pepperjack with a bit of red and green peppers, but not very spicy though. It’s Doni’s favorite. We used Violife Mushroom Cheese slices & Original Creamy Spread in this dish. 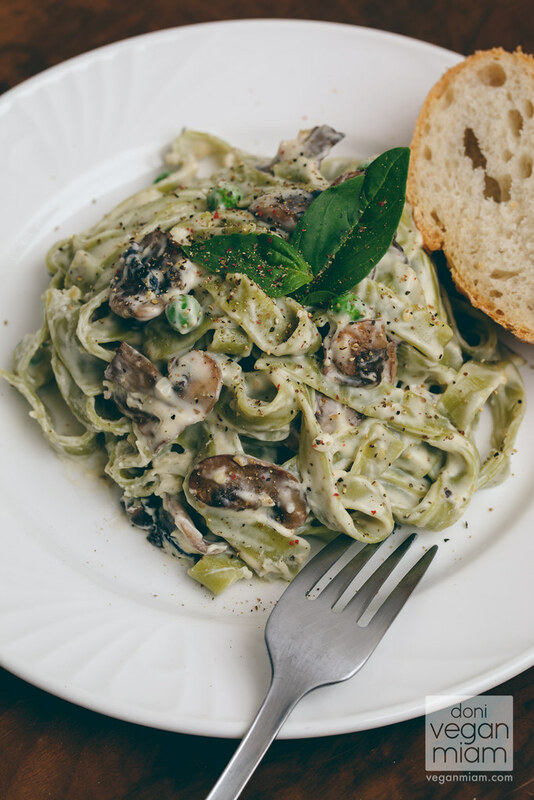 Thanks to Violife cheese and creamy spread, this Creamy Spinach Tagliatelle dish was one of our favorite main courses – so creamy and rich just like a Fettuccine Alfredo dish. The Violife Mushroom Cheese has dried mushrooms and truffle oil flavor, which was pretty tasty. The Violife Original Creamy Spread is a cheesy spread, not cream cheese. My personal favorite savory snack – a vegan spelt croissant from a Spanish artisan bakery (El Horno de Leña), with a Violife Vegan Mushroom Cheese slice or would you rather call it a croissant grilled cheese sandwich? We used Violife Tomato & Basil cheese (shredded using a cheese grater), halved raw grape tomatoes and sautéed courgettes on the puff pastry “pizza.” The color of the Tomato & Basil cheese is a beautiful “cheddar”, and it has a slightly sweet, but a robust, savory tomato flavor with a mild basil aftertaste. 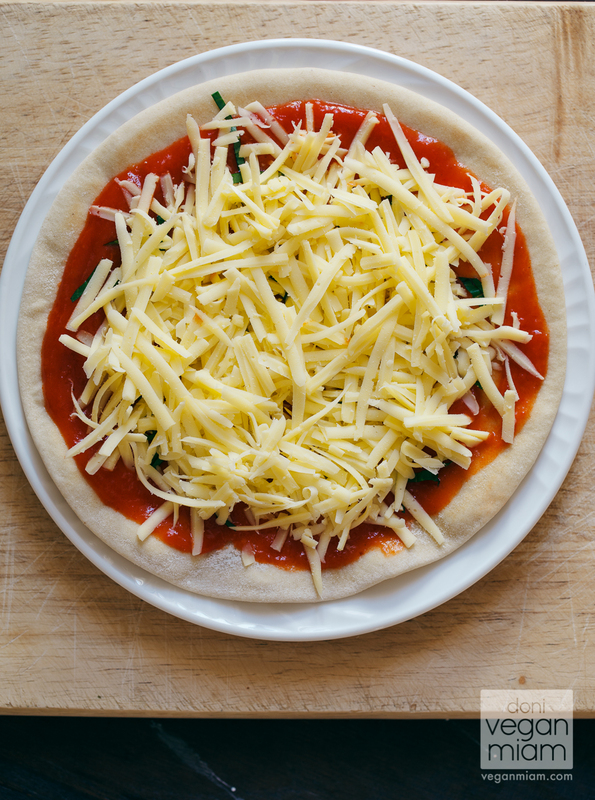 The Violife Tomato & Basil cheese melts perfectly on the puff pastry. 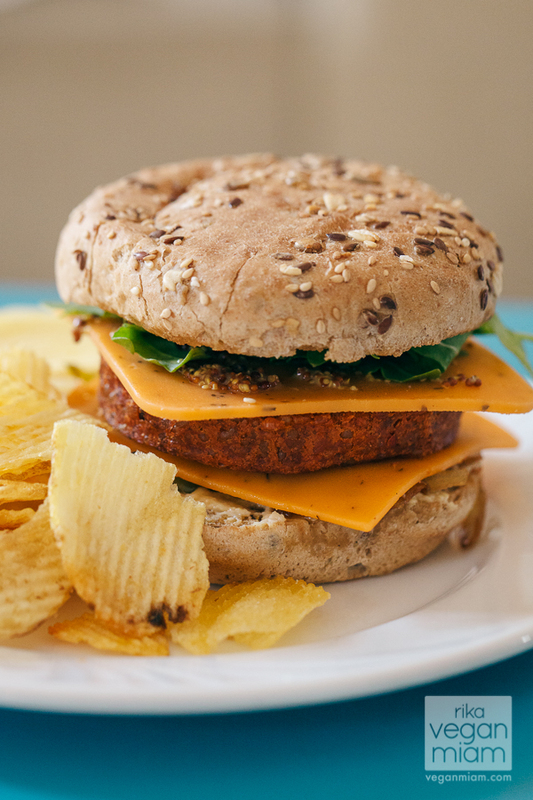 Our Vegan Monster burger has Violife Herb cheese slices, veggie soy patty, arugula, roasted grape tomatoes, Italian sweet peppers, gluten-free garlic mayo by Granovita, and wholegrain mustard (from Carrefour). Aren’t these mini vegan toasts cute? We found them at El Corte Inglés in Valencia, Spain (view our post here) and they were pretty cheap, about €1.50 a loaf and vegan. We tried the Violife’s Original, Tomato & Basil, Herbs, Hot Peppers, and Cucumber & Dill creamy spreads. Our favorites are Cucumber & Dill and Hot Peppers. I hope one day Violife will include Mushrooms (Truffle Oil) flavor in the creamy spreads, which is my favorite. 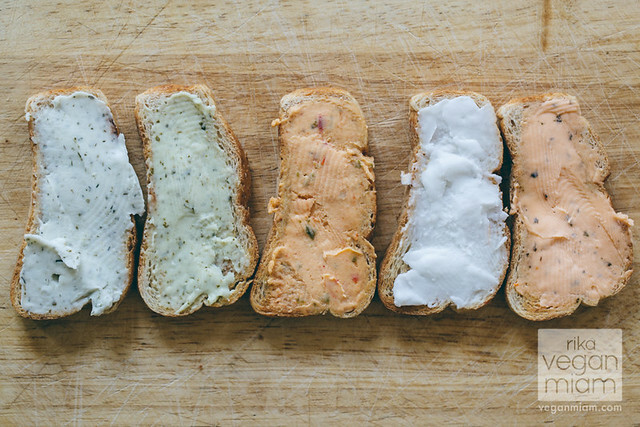 Violife Creamy Spreads on Toast: (from the left to the right) Cucumber & Dill, Herbs, Hot Peppers, Original and Tomato & Basil. This is our favorite flavor for the creamy spread. They don’t have cheese slices or block in that flavor, only the creamy spread. The creamy spread has a fresh smell from the cucumbers, but the dill flavor is there. Very fresh and tasty! Great as a spread on bread or sandwiches. Pair with something salty. An omnivore (my best friend) claimed that it reminded her of a Greek tzatizki spread, and it is her top favorite among the others she’ve tried. 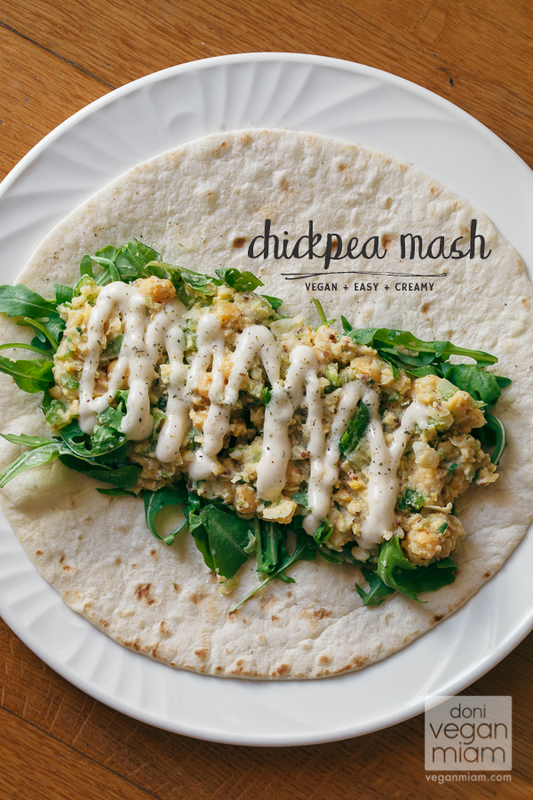 We used the Cucumber & Dill creamy spread in our Vegan Chickpea Mash recipe. The aroma and taste of the basil is obvious. Spread it on some warm toast to make it even creamier. There are visible dried herbs. What’s interesting about this flavor is the inclusion of mashed potato in the ingredients. Our second favorite flavor for the creamy spread. Mildly spicy. Looks like a “cream cheese” cheddar block, but the smell is distinctively red peppers. Visible green & red peppers. It has a mild, tangy flavor and smooth texture (when warmed up), but serve as a base for most creamy dishes, e.g., Mac & Cheese or even a vegan cheesecake (sadly we didn’t make one). We used the Original creamy spread in both dishes: Creamy Spinach Tagliatelle & Mushrooms and Vegan Tiburón & Cheese (view recipe). The fragrance of the basil is more noticeable than its taste. The creamy spread itself is mildly sweet due to the tomatoes. 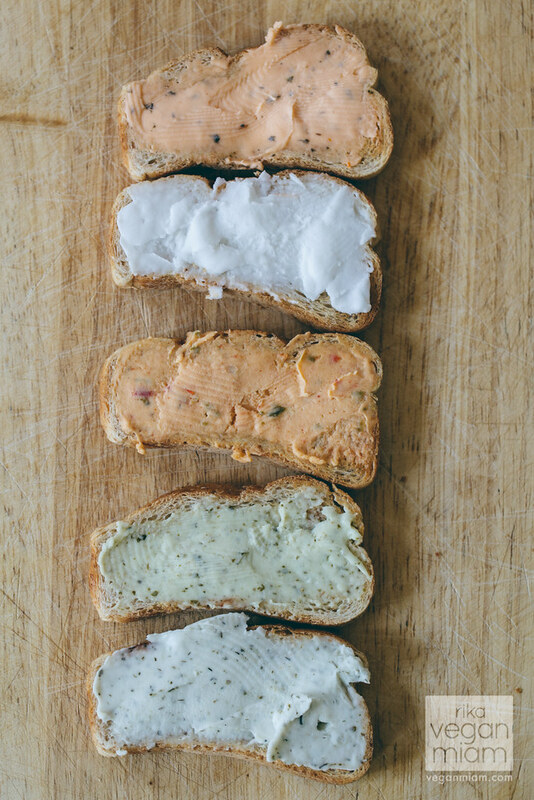 It is not one of our favorites, but we enjoy using the Tomato & Basil creamy spread in sandwiches and pasta dishes – with something savory or spicy otherwise it can be too sweet on its own. 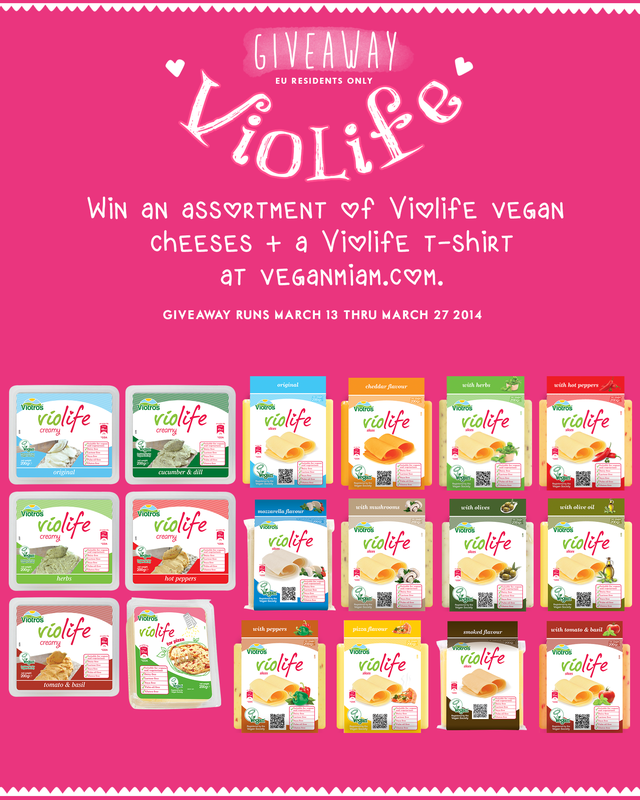 Violife has been generous enough to host a giveaway of an assortment of their vegan cheese alternatives and a T-shirt to one of my amazing readers. This giveaway is open to EU residents only and will run until Thursday, March 27th, 2014 at 11:59pm EST. Please use the box in the end of the post to enter the giveaway. If the widget does not load for you or you are unable to see the widget, please go here directly to enter. Which Violife cheese flavors will you like to try? What are your favorite cheezy meals?